There is that day that we all wait for: when the phone rings and we are asked to come along for a ride – a ride into a dream from another world, maybe even another time. Such was the case when Pamela Babey and Steve Henry of San Francisco’s premier design firm, BAMO, received a call from Bob Burns, an old client, friend, and collaborator. After the 1992 sale of his storied hospitality group, Regent International Hotels, legendary hotelier Bob Burns purchased Villa Feltrinelli along the shores of Italy’s Lake Garda and set about turning it into his perfect summer house. Uncompromising to the last and with vast budgets blown, Burns ultimately brought in BAMO to fashion his retreat into one Europe’s most dreamy hotels. The Villa, built in 1788 for the Feltrinelli clan, had a storied past including an occupation by Italian dictator Mussolini, from 1943 to 1945, where he ran the Fascist puppet republic of Salo. Although the view of the water from his bedroom, now known as the Magnolia suite, didn’t appeal to him. Mussolini hated lakes. Opening in 2001, Villa Feltrinelli offered guests a fantasy of towers and frescoes bathed in wonderfully lavish interiors and cradled by sumptuous lawns and pools of marble. Having just completed a light-handed update of the Villa’s interiors in 2014, Pamela Babey and Steve Henry talk to CaenLucier about their personal stewardship of this legendary continental property. CaenLucier: BAMO has a made name for itself in the hospitality space. How did the firm get established working with hotel owners and operators? Pamela Babey: With hotelier Bob Burns, it was with the Pfister office and a prior existing relationship with his earlier Regent Hotels. This led to the design of the Four Seasons Milan and the Villa Feltrinelli. We first worked with Mandarin Hotels--probably because we were next door--and had experience in doing several hotels from previous offices and they were renovating. It was a simpler process in the 1990’s. CL: Villa Feltrinelli is such a magical location and a storied, family residence. What was it that Bob Burns initially saw in the property and how did you work with his vision to create what welcomes guests today? PB: Bob was fascinated by The Point in The Adirondacks. The idea that one could stay in a lodge and feel “at home.” The concept that you would not feel that you needed to lock your door, that everything was taken care of and personal. Bob thought Italy could do this even better with more romance and style and the best food! We began the discussions and the stories, worked with him for approval on the basics, and from there we just built a dream. CL: You mentioned that exceptional hotels come from exceptional property owners. How have you seen Burns’ style mature over the years as an hotelier? PB: For me Bob did not mature… he was perfect, he had done this for years top to bottom. Steve and I matured. We learned to care about every little knob, and hook and painting: every cushion, every chair’s comfort and purpose. It was an amazing experience. Then to top it off, we worked hand in hand with the training of staff until the opening celebrations. It was a complete sort of project rarely seen today. "The setting of the house on the lake, the constant sounds of the waves, the breezes, and the majestic old trees in the gardens. The Villa interiors are amazing, but when you add in the atmosphere of the surroundings, it becomes a full sensory experience." CL: Do you remember the feeling you had when you saw the villa for the first time? PB: YES, It was a chilly February night. The project manager picked me up from the Milano train, and we drove over the hill at Salo on a very damp night. Driving up the lake for about an hour was rather romantic, and arriving at the villa, coming down the steep drive to a deserted house, was mysterious. Walking in through the padlocked doorway, into the poorly lit foyer was almost disheartening! Its feeling was sort of lost in time, with no sparkle. The next day under the sun and glitter of lake, all possibilities were apparent and the future was thrilling. Steve Henry: Absolutely, it was late afternoon and all the rooms were shuttered. Lightbulbs dangled in the center of each room by a wire illuminating the most wonderful painted ceilings and woodwork—all covered in decades of dust and cobwebs. I opened a shutter in what would become the bathroom of Turchese and a bird fluttered and snuck out to the gardens through a busted window. CL: How does it feel now when you revisit the property? PB: It feels fabulous! It is breathtaking and such a marvelous location. No wonder some guests come back each a season. SH: It feels like going home. When Pamela and I returned in 2014, it was the first time I’d been back since the opening in 2001. Everything was absolutely the same as we’d left it. It was impeccable. We sat on the terrace and had a glass of prosecco as a guest departed in a helicopter right beside us. CL: What parts of the property are most inspiring to you? PB: The walk along the lakefront. Sitting on the “front porch.” Closing the door behind you in the cool dark Veneziana room, I love it. SH: The setting of the house on the lake, the constant sound of the waves, the breezes, and the majestic old trees in the garden. The Villa interiors are amazing but when you add in the atmosphere of the surroundings, it become a full sensory experience. CL: Did you try to give the interiors a specific Italian look and feel or, simply, old money elegance? PB: Definitely understated. No cliché glamour. But guidelines of fresh, Italian. Italian-made, and with objects from the family visits around the world. SH: When we first designed the Villa, I would bring things to show Pamela and she would always say to me, “That doesn’t look Italian. We have to make it an Italian country house”, so I learned!! As the project neared completion, everyone’s curiosity was so heightened. Mr. Malzonni, the head restoration expert was always puzzled, trying to understand what our final rooms would look like. He was expecting a very serious Italian museum-like approach and he was so pleased that we respected the integrity of the rooms but brought a very livable, relaxed atmosphere of a private home - one that was lived in and nurtured through the generations. CL: When you completed the project, what rooms or attributes of your work please you the most? SH: I was happy that we were able to achieve a really layered atmosphere. 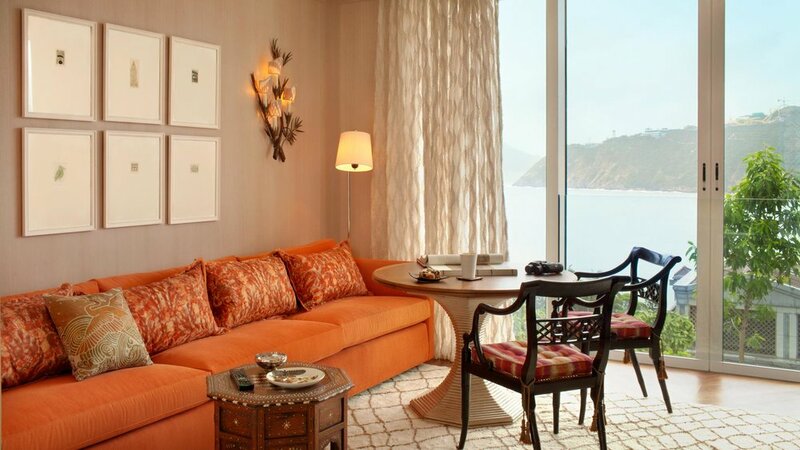 As you walk from room to room, you truly feel like you are a guest in a luxurious private house. In other words, there is a very strong point of view that is consistent throughout all of the Villa. PB: There is a feeling that you could “live there,” it is not untouchable and precious. It may not be apparent in the photos, but when there it is very comfortable wither you curl up on the terrace sofa with the newspaper and coffee, or drew up for dinner in the evening. CL: How do you define luxury? PB: Luxury here is a sense of freedom, an environment of pleasure and satisfaction. A visual calm and the presence of nature is definitely a key player here. SH: To me, luxury is being taken away from my day-to-day world and given a wonderful experience that enriches my life. 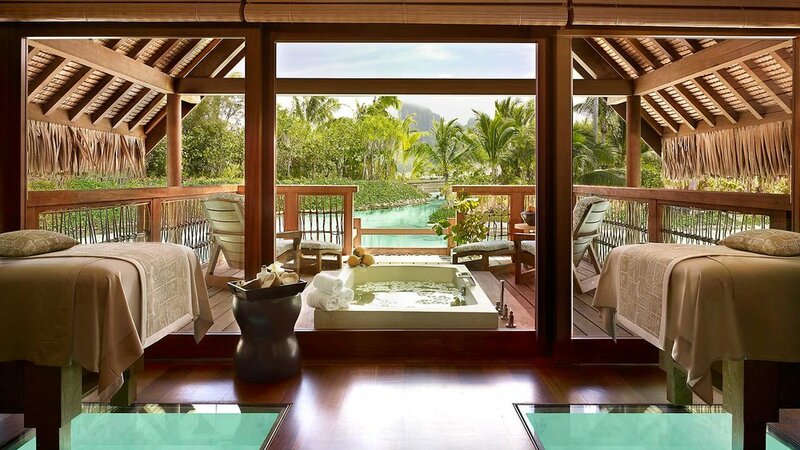 Luxury is an escape from the real world. CL: How did you approach your recent updating of the villa? Were there specific items on the list to tackle and were there improvements that were identified organically from a second look? SH: For our “new look” we were very careful not to change the mood, but we definitely lightened the palette and a new “summery attitude” to the rooms. The Villa is open from the spring through the early fall, so it’s a summer place by the lake. PB: Part of how we approached it was to include artisans and workshops from the local area to do paintings and slipcovers, so they have a personal, vested connection to the property. We wanted most of what was done to be Italian, all of the craftsmen and workrooms are from the surrounding villages and towns: the painter, the woodworker, the seamstress. CL: What is your viewpoint on the importance of a hotel’s guest reception experience? SH: At the Villa, it’s a very old fashioned greeting – the charming married couple Gabi and Peter meet you on the front terrace with a bouquet and glass of champagne as your car sweeps down the drive and the front entry is brought into focus. It’s a bit like arriving at Downton Abbey. They whisk you inside and out onto the lakefront terrace while your luggage is taken to your room and unpacked for you. PB: When arriving you see little glints of the lake through the trees, stepping inside to the cool foyer and seeing the full lake view is both exciting and calming. I think this sets the mood for the visit. CL: How does a particular property inform design decisions? SH: You always have to let the individual property lead the way. You have to do what the project wants, not necessarily what you want as a designer. For the Villa, each guestroom is different and unique. Since it was to feel like a grand country house, there are tons of antiques and objects that we bought in little towns throughout the region. These give that personal flavor that we sought. CL: How do you approach a master bedroom and bath in a hotel as opposed to a private residence? SH: For a hotel, you are striving to please a broad range of tastes. For a residence you are working directly with one of two people to give them exactly what they need. The design becomes much more personalized. PB: On this property we have sort of two styles, the Villa has a white marble and tile environment that is “more of the estate.” While the buildings scattered on the gardens, the Casa di Fiori, the Rustica, and the Limonaia, have hand-painted tile bathrooms that are a bit more of the “Italian Countryside.” Both have every comfort and every element well placed and thought of. "You always let the individual property lead the way. You have to do what the property wants, not necessarily what you want as a designer." CL: What other hotels in Italy or, for that matter, internationally do you dream about? PB: Aman in Venice (I want to redo it) and I want to see the Ritz in Paris. CL: Speak to our readers about the importance of lighting. SH: It is super critical and when it is done right, you aren’t consciously aware of it at all. You just know that something has been done to make the room look just right. What Bob Burns taught is that when dining, nothing makes a person’s face look more seductive than when lit by the warm light of a well-placed lamp. So when we designed the dining room at the Villa, we dotted red silk lampshades around the room, and created new wall sconces that look as if they had been there forever— and they have red shades too. Then we did clever things like developing historically evocative up-lights that softly light the old painted ceiling. Our lady in France who developed them from our sketch called them “the black lettuces.” Everything goes into place and then we dim all of the lights so that each one plays its own individual role. CL: How has your experience given you an eye and a feel for layering details and finishes? CL: At this point in your career, what would a dream project look like? SH: Honestly it was our recent refresh of the Villa, because our client told us to “just do what you feel is right.” It takes a lot of confidence for a client to give you that brief and then to let you run free. They didn’t hover and question what we did. Every detail of every room was reconsidered but with the overarching idea that a return guest would arrive and think , I don’t know what was done but somehow it feels even lovelier that I had remembered. Stacey Caen and Joe Lucier thank Pamela Babey, Steve Henry, and Alyssa Terry for the creation of this feature! In 1991 BAMO was born. Initially working together at Charles Pfister's eponymous San Francisco design firm, Pamela Babey, Michael Booth, Gerry Jue, and David Moulton set out to carry on the principles of Pfister’s firm as a foundation to explore their collective talents and create the BAMO alchemy of quality, service and attention-to-detail. With the addition of principals Dorothy Greene and Steve Henry, the firm has built a reputation that solicits calls from the hospitality world’s top tier as well as the world’s most discerning residential clientele. To experience a BAMO project is to admire a work of art – one that defies fads with timeless elegance, formulas with inventive design, and everyday life with the sophistication of true luxury. 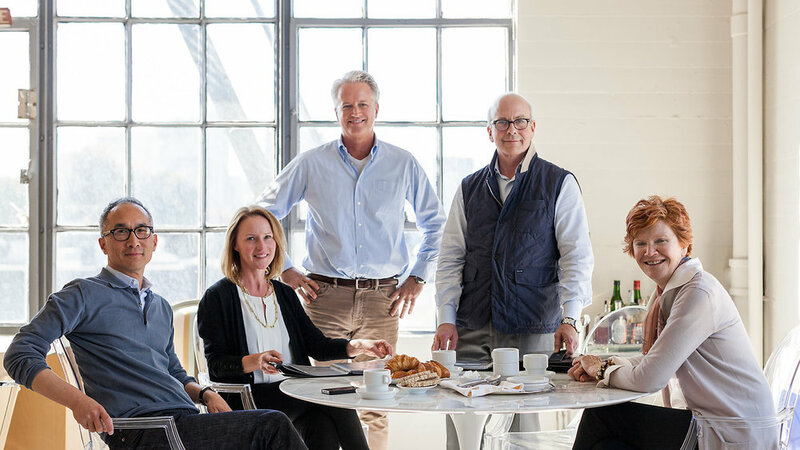 CaenLucier had the opportunity to sit down with these San Francisco design luminaries to offer our readers an opportunity to hear the dialogue inside the heart and soul of BAMO. Enjoy the read! CaenLucier: When BAMO formed in the early 1990s, what design principles were brought along from the team’s prior work with Charles Pfister? Do any of those design maxims remain today? Michael Booth: Yes, those maxims still resonate today. You need to watch the Charles Pfister video on YouTube. Pamela, Gerry and a little bit of me are interviewed extensively about Charles personally and his firm. You’ll learn all you need to know about the roots of that office. That said, we have moved on with our own identity and the Pfister legacy is part of our history. Gerry Jue: We brought many design values with us from the Pfister office: e.g. a strict attention to detail, the importance of lighting, and clarity of color. But we also felt that the new firm was, and still is, our opportunity to explore new ideas and new ways of achieving them. CL: How have you seen the interior design profession change over the last 25 years? MB: That’s a big question. Biggest for me is the level of sophistication and “worldliness” of our core client base which has grown dramatically. Dorothy Greene: Maybe as a result of this, we’ve seen a gradual change from illustrating or presenting a design to the client, to a more immersive process of narrating the full story of the design – from context and inspiration through to the resulting design concept. GJ: The way designs are generated, studied and presented has changed drastically. Twenty five years ago everyone from partner to intern communicated about design through drawing - it was the common language regardless of age. And drawings, along with physical models, were how we presented a design. Since then, technology has really changed everything - from how we work inside the office to how clients expect design work to be presented, to how much financial resources are needed to service that technology. And all of that in half the time we used to have! "A true collaboration and open sharing of ideas between the architect and interior designer will create the most seamless and successful projects." CL: Working on hospitality projects all over the globe, how do you best succeed with different cultural business practices and construction work ethics? DG: That’s a great question. Each country has its own cultural communication and construction process, and conducting work in, for instance, Brazil is a much different process than working in a country like Japan. The key is to listen, observe, and adapt. The goal is always the same – to have a successful project for everyone involved – and we realize that the road to reaching that goal may not be the same for each project. CL: You have had a client in Japan for over 25 years. What benefits and challenges, if any, does such a lengthy relationship offer? GJ: The benefits come from knowing each other so well; the challenges come from knowing each other so well, too. We're like an old married couple! It's a constant struggle to keep the relationship - and the work - from getting stale and predictable. Sometimes we have to push hard to get new and innovative ideas approved. Through it all, however, the trust and respect we have for each other comes through in the finished work. CL: When you dance the perfect dance with an architect during the design process, what does it look like? MB: A beautiful marriage between inside and outside that one would never know or appreciate until you see it finished. DG: A true collaboration and open sharing of ideas between the architect and interior designer will create the most seamless and successful projects. CL: LEED certification receives a tremendous amount of attention these days. You were involved in a “ground up” residential project in Portola Valley recently. What was that experience like? MB: It was one of the most valuable and interesting later-life learning experiences I’ve had. It was a truly “hands on” learning process about sustainability and the holistic nature of the building, occupants and community beyond. For me sustainability is about responsibility. CL: Does BAMO have a signature look in the hospitality world? DG: A reputation in the hospitality world for quality, service and attention-to-detail. "One project having both hotel guests and residential owners opens up tons of exciting challenges...hotels that are as comfy as residences, and residences that are as glamorous as hotels." CL: You are currently working on creating new ‘entry experiences’ and amenity areas for a few office building projects. Where do you see the similarities and/or differences in creating this experience as opposed to a hotel or a private residence? GJ: That’s funny because our office clients want us to bring our hotel experience to the design of the building entry and amenity areas. In either case, the goals are similar: create a ‘wow’ moment, foster activity and buzz, and make everyone look great. DG: Hotels and public lobbies play to a wider audience and usually aim to make a strong impact. When designing an entry to a private residence, sometimes the project calls for a ‘wow’ factor experience, but more often it takes on a more subtle and personal mood. CL: BAMO has grown along with the advent of residential ownership being integrated into hotel projects. 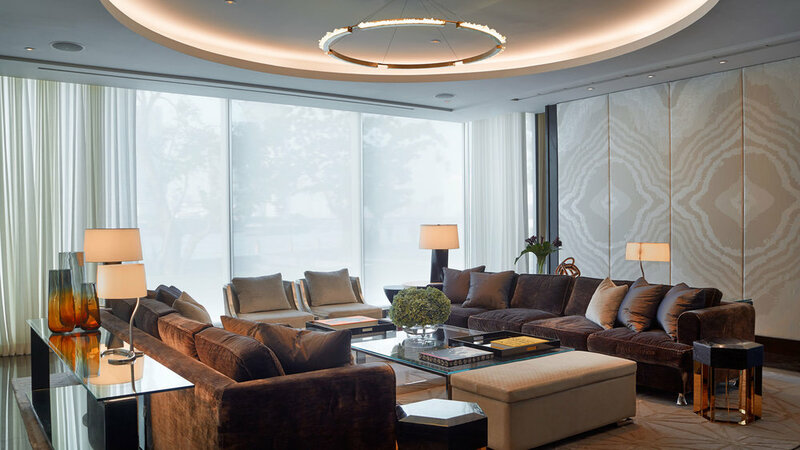 You have recently completed such a mixed use project for the Four Seasons in Bangkok. How have you seen this overall real estate package refined over the years? GJ: In the early days, it seemed that the main purpose of residences was to pay for the hotel; now the hotel is often there to sell the residences. Of course, from a design point of view, having both integrated into one project and having to think about both hotel guests and residential owners opens up tons of exciting challenges and opportunities: hotels that are as comfy as residences, and residences that are as glamorous as hotels. CL: What are your favorite aspects of working with residential clients? MB: Interpreting their goals and aspirations in ways they may not have thought of before. CL: Explain the importance of lighting. MB: It is absolutely critical to the success of any interior design. It sets the mood, ambiance, and comfort of the occupants. CL: Are there any occupational hazards when you personally select a hotel for a special vacation? MB: Many. The more expensive the hotel the greater potential for disappointment. GJ: If it's not perfect, either the manager will drive you crazy or you will go crazy yourself! CL: What does the perfect Sunday morning look like? MB: Beautiful linen sheets, sleeping children, and a snoozing dog. DG: Coffee, quiet, and time to flip through the Sunday NYT and Saturday WSJ. The only days of the week I get physical newspapers anymore…. GJ: Dark, because my eyes will be shut tight; comfy, because I'll be in my own bed; and quiet, because no one else is awake yet. CL: Do interior designers ever retire or do they design forever? MB: They never retire, right up to designing their own funeral probably. GJ: No, we will always rearrange the furniture in our hotel rooms! Stacey Caen and Joe Lucier thank everyone at BAMO that came together for this feature!